In an effort to consolidate the vast amount of shoes I’ve been able to try in the last 3-4 months, I’m going to group shoes into a couple categories and give brief reviews on each of them. I’m still planning on doing in depth reviews on shoes as well (and have a few shoes already set aside to do so) but in an effort to give some testing feedback on as many shoes as possible I’m going to put together three different round-up reviews of Light Trail Shoes, Protective Trail Shoes and Mountain Running Shoes. Hopefully there is at least a shoe or two that every reader is/was curious about! 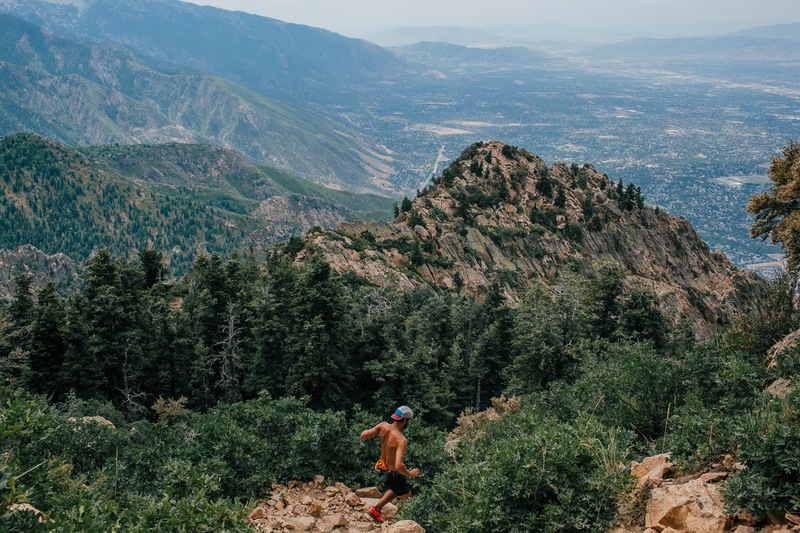 This is the third installment covering mountain running shoes after the first two round-ups which covered Light Trail Shoes and Protective Trail Shoes. I’ve ranked them in roughly the order of my most favorite first to the shoe needing the most improvement at the end. Specs via Running Warehouse (click on shoe name) unless otherwise indicated. My first experience with Scarpa was with the TRU which I reviewed in a roundup last year. Overall I like the fit and design of the shoe but found the midsole to be quite harsh. My biggest worry about Scarpa’s otherwise great looking 2016 lineup was that the midsole material would be super firm like the TRU. I’m happy to report that the Atom (along with the Neutron and Proton) all have much better feeling rides. The Atom has really grown on me over the summer for technical mountain terrain. It has a very precise ride that inspires confidence on tricky terrain. The Vibram Megagrip outsole is fantastic and really ties together the otherwise pretty minimal shoe. Additionally the upper is nice and secure while still being pretty comfortable and sock like. My only wish was that there was a small rockplate in the forefoot to help just a bit with some rock protection on harder surfaces. It is pretty minimal overall and just every so often that fact is brought to my attention in really rocky conditions. That said though, it is one of my favorite mountain running shoes ever and the best I’ve tried this year. Go check them out! Well padded tongue, lace pocket (yes!) and secure yet comfortable upper. I did trim the midsole up a tad to increase sharpness…result was good. The Neutron is also a great option, that while not as nimble, offers a ton of protection and is still precise enough for tricky terrain. The Proton is very durable and protective and runs much better on hard terrain than the Atom or Neutron. All in all Scarpa definitely hit the mark with their new lineup and quickly moved to the top of my list when I look for a shoe to handle technical routes. Scapa Neutron – Great all around mountain shoe with tons of protection, traction and good upper comfort. Salming has been on a roll over the last couple years and they haven’t really introduced a bad shoe yet. At first I wasn’t sure they could carry the magic over to the the mountain running segment since it tends to be a niche that more technical/moutnain oriented companies better understand. The Elements defies the odds though and Salming came through with a great shoe for steep, loose and soft terrain. The fit is secure and yet quite roomy in the forefoot compared to many other mountain/fell running shoes. A fairly wide toebox for a mountain shoe and good overall upper padding too…something not always present on mountain shoes. Super deep lugs do well in soft terrain and the shoe is very stable and natural riding like most of Salming’s lineup. Other than the slightly higher price tag (a common theme with Salming) I really can’t find too many issues with the shoe when you consider its end use. I might also like a light rock plate on it like the Scarpa Atom so as to expand the type of terrain it can handle. I’m a big fan of plates for lower stack shoes since you can add a ton of protection at a low weight penalty and little change to the ride. Spiked mountain shoes are a very niche category and typically, other than Icebug, Salomon with the Spikecross and Merrell with the All Out Terra Ice, inov-8 has been the only other brand producing these types of models. Arguably they’ve been doing it the longest, at least on a larger scale, and I’ve run in the inov-8 OROC 280 and 340 for many winters. The 340 was and probably still is the gold standard for me in a spiked shoe. However, one area that I’ve yet to see a company succeed is in making a spiked shoe with a roomy upper. That was what intrigued me about the Arctic Claw 300 initially is that it is built on inov-8s wider Standard Fit where as all of their other past spiked models (and pretty much any other spiked shoe ever produced) has been quite narrow fitting. The Arctic Claw comes through in providing a fairly roomy toebox but still manage to have the rest of the shoe perform with aggressive lugs, spikes and even, to some surprise, a little bit of cushion in a technical shoe. If you’ve shied away from spiked shoes in the past for winter or very wet running because of fit, the Arctic Claw 300 is worth a look. The companion Arctic Talon 275 is also quite good and more in line fit wise to the OROC 280 and 340. inov-8 continues to do well in these more niche categories where as I’ve felt they’ve struggled a bit in making good all around trail shoes in the last few years. I was intrigued when Salewa introduced their Lite Train earlier this year. It has a lot of features I look for in a mountain and lighter shoe (medium to low drop, rock plate, full outsole, secure lower volume upper but with medium to wider toebox) and I’m always happy to see new entries into my favorite shoe category, particular from companies with mountain expertise that haven’t yet taken a stab at a running shoe. Of course along with this comes some growing pains and rarely do brands nail it on the first try (the Salming Elements above is probably the biggest exception to this rule that I can recall). Mainly this comes in the form of the upper being slightly overbuilt with a very heavy and hot suede-like material lining about 75% of the inside of the shoe, backing the mesh. This results in a very secure fit but the shoe is hot and the upper doesn’t move as freely with the foot as I’d like and is particularly an issue where the tongue is sowed on the upper which is very thick and has irritated the top of my foot. The last shape is really good though and the foot hold is fantastic so some bright spots in the fit there. The outsole is also quite nice with Michelin branded rubber which seems quality so far. A forefoot rock plate adds just the right amount of protection for a light shoe. Good last shape and overall a well done first attempt. Really the biggest issue besides the slightly overbuilt upper is the midsole material, and thus ride, is sub par and is pretty noticeable compared to many offerings now on the market. 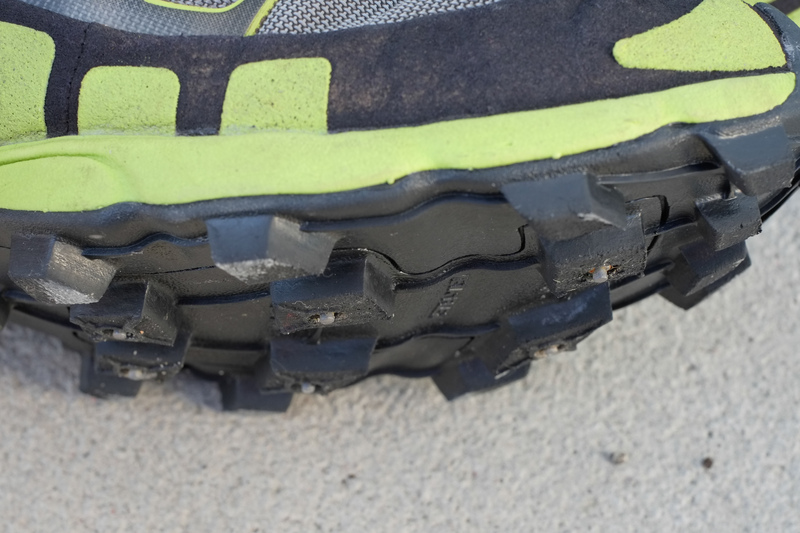 For shorter outings and on really rough terrain it is not as noticeable, but on hardpack trail the shoe just doesn’t inspired much in the ride department. That said, I like the feel, ride and fit better than something like the Salomon Sense and Sense Softground so it really is not a bad shoe, just still room for some improvement. Man, I cannot tell you how high my expectations were for the Terrex Agravic. I’d seen glimmers of greatness with the Terrex Boost (now call the Skychaser) and was hoping that the Agravic would essentially keep the good elements (great outsole and midsole/ride) of the Skychaser and address the upper comfort issues and produce in in a slightly lighter and more nimble package. I tried everything to get the Agravic to work for me, including modifying the lacing and upper to get better security and relieved high lacing pressure issues but to no avail. The Agravic upper simply is just not cut out for the job. The EVA tongue design is awful, stops zero lacing pressure and is super sweaty on the foot. The mesh is mostly comfortable but adidas chose to put a stitched overlay right at the pinky toe and side of the 1st metatarsal which are not comfortable. Additionally, the upper just doesn’t hold my foot on the platform so taking advantage of the great Continental outsole is not possible. The midsole, while similar to the Skychaser, is actually a little less precise, especially in the heel area which moves it in the wrong direction for me. Agravic on top GTX version on bottom. Tried everything I could to salvage Agravic upper including punching new lace holes and removing the offending forefoot overlays. A huge bummer, but I really can’t recommend the shoe. I will say the GTX version doesn’t have all the issues of the regular. With the GTX membrane it has more support in the upper and also the eva tongue isn’t full length like in the regular version. I can actually see using the GTX version some this winter, but wouldn’t consider it in any temps above 35 deg F.